We should have been more vigilant! 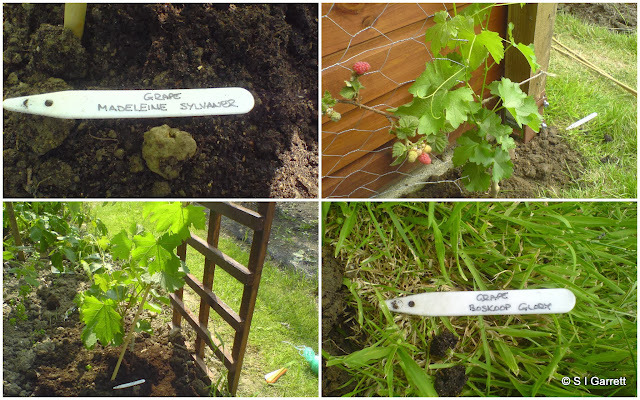 Back in 2009 we decided to plant a couple of grapevines on the plot - a green Madeleine Sylvaner and a red Boskoop Glory. To be honest we didn't really expect them to produce grapes but thought it was worth a try! 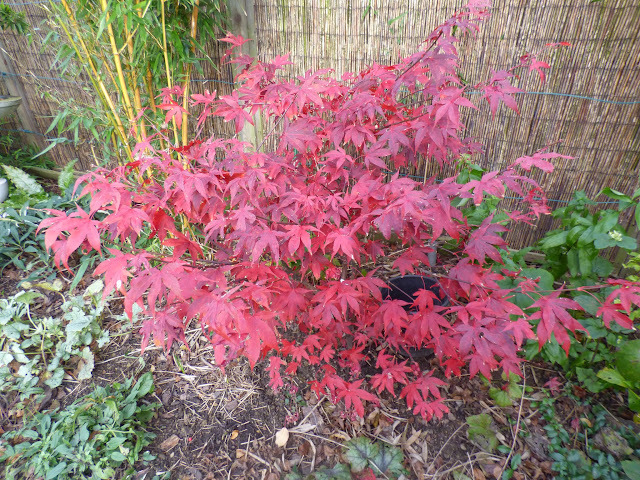 One was planted to grow on the side of the shed. 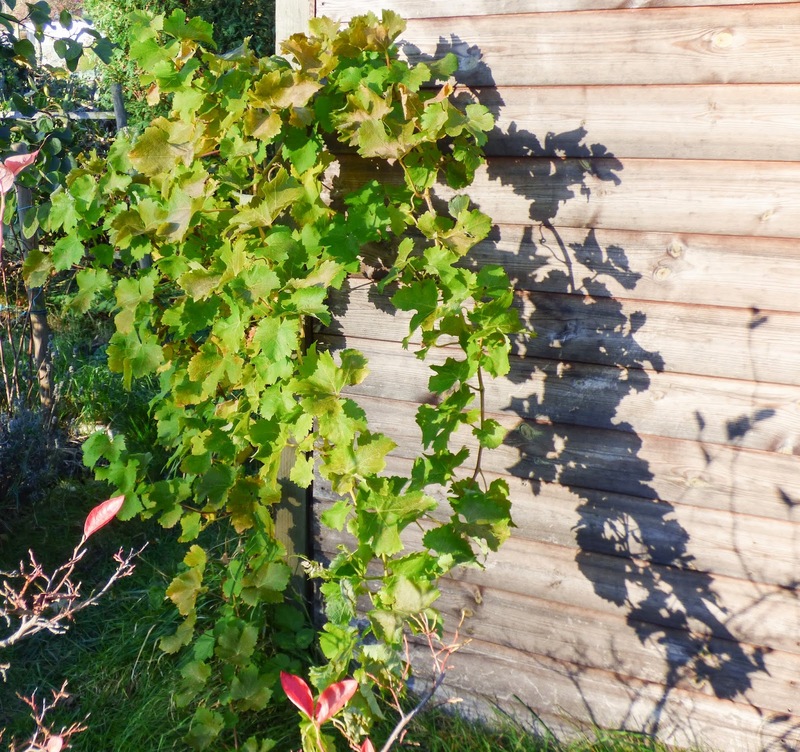 It gets really hot inside the shed when the sun is shining so we thought a grapevine would have a better chance of producing some fruit here. 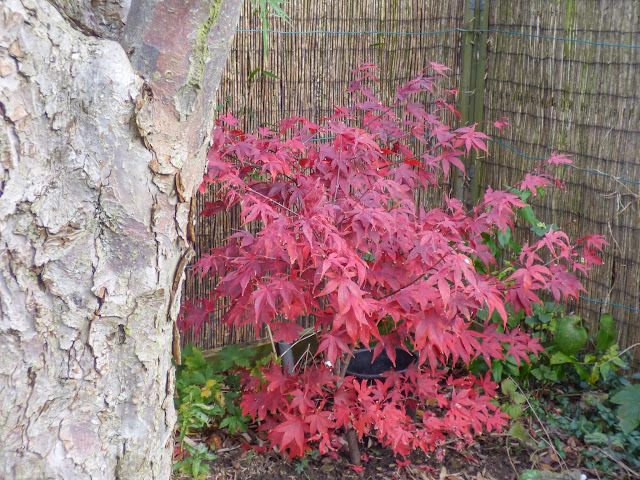 The other was planted to grow up an arch that our plot neighbour had erected between our two plots. 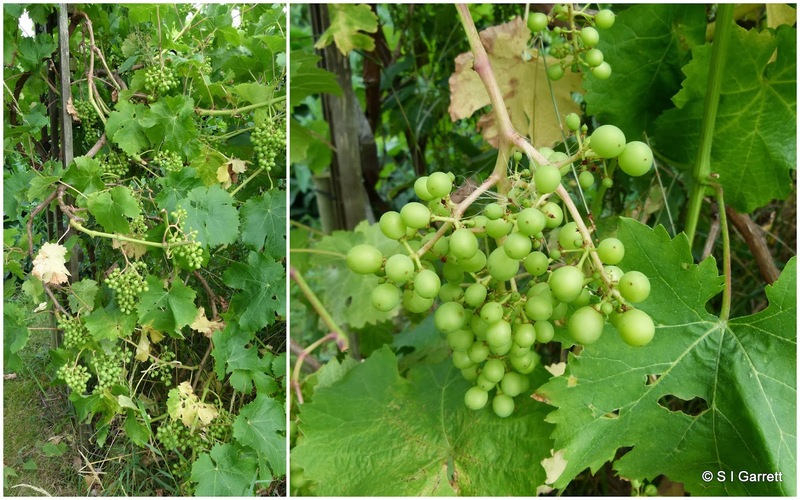 The vines produced lots of top growth and looked very healthy. 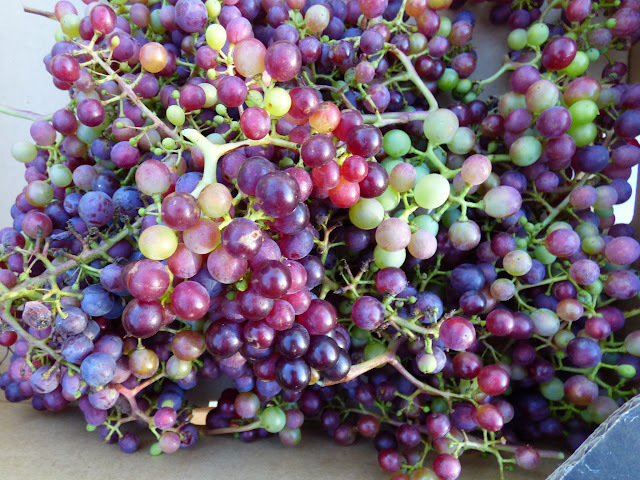 In 2011 Boskoop Glory did produce one or two bunches of grapes but these didn't develop, staying tiny and green. In the photo below they look much better than they actually were as you don't get a sense of scale. I guessed that was likely to be as good as it would get and dropped my guard. Then this August I decided that the vine growing up the arch needed some attention. 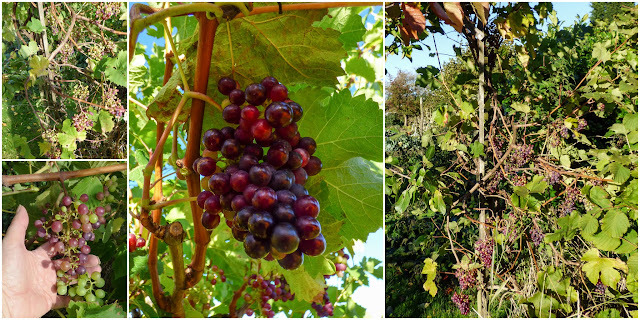 It was then that I spotted dozens of tiny bunches of grapes hiding under the foliage. I removed lots of the leaves - something that I should have done much earlier - and at that point really should have thinned out the bunches but I figured it was too late to expect the grapes to ripen. 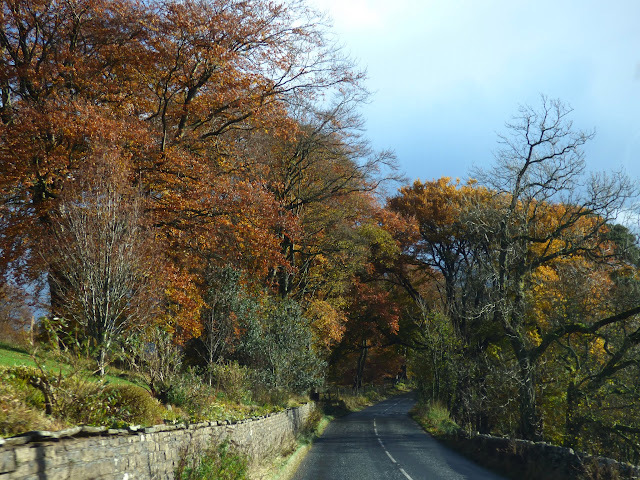 But look what happened - they actually turned colour. Now I wish I had given the vine more attention. 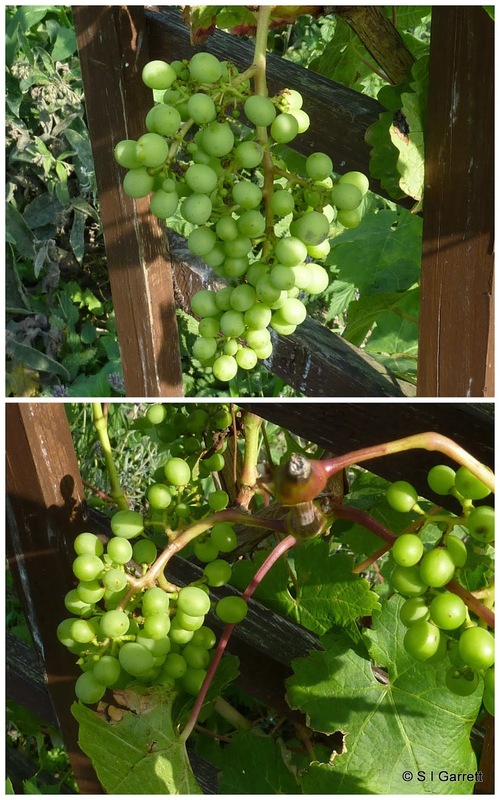 Next year I will be more vigilant and try to get some fully mature ripe grapes. We have gathered all the bunches but the really tiny grapes each containing several pips are not really any good for eating. We had considered making grape cordial but once the pips and skins were strained out there wouldn't really have been much left so the tiny fruits will be left on the patio table as a treat for the blackbirds. 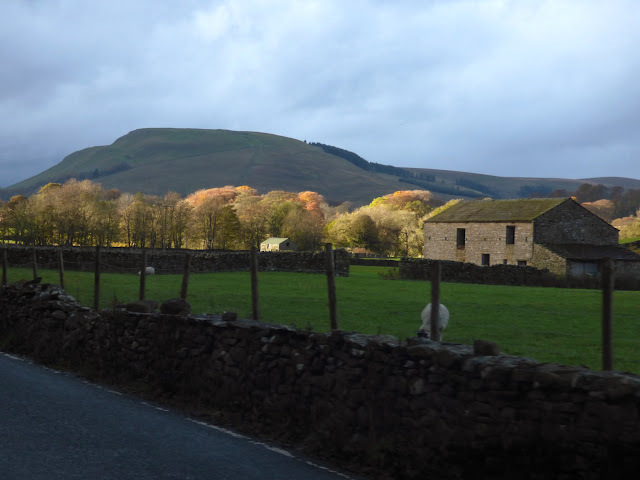 The birds tend to be more daring and come closer to the house as winter tightens its grip. Last year our patio table doubled as an extra bird table. Madeleine Sylvaner hasn't made any effort to produce fruit which is a shame as being against the shed if it had any fruit I would be sure to notice. It needs to be pruned and trained against the shed. As is the gardeners' motto "Ibi semper est in anno altero"
Visiting the plot these days tends to be a far shorter activity. If the weather allows we just set ourselves a small task after which once completed and a few vegetables have been harvested we come home. 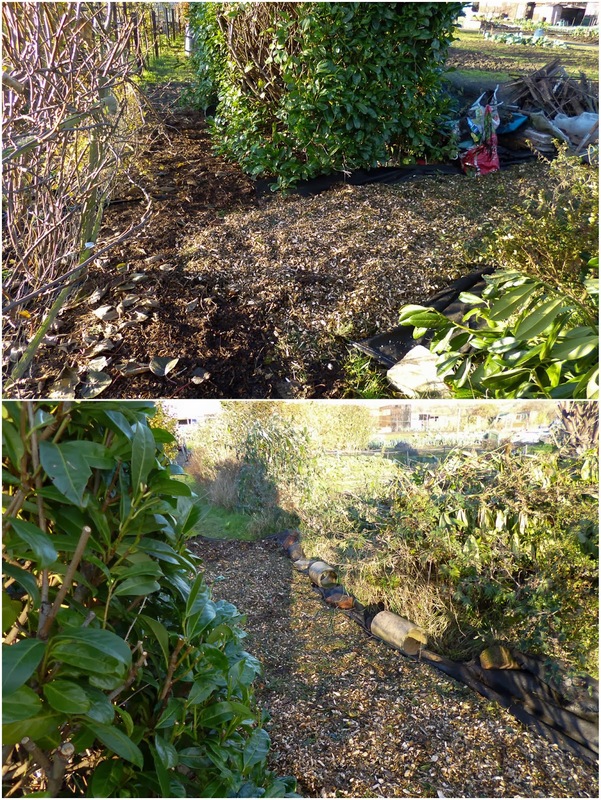 This weekend's task was to finish spreading some wood chippings on part of the plot that has proved difficult to keep under control by just cutting grass. We laid weed control fabric down and whilst Martyn barrowed chippings from the site chippings' bay, I smoothed fabric and spread mulch at the same time as having a chat to a plot neighbour. (Multi-tasking female at work). This job finished all that remained was to harvest a few things namely , leeks, beetroots, carrots and our first parsnips. We have some sprouts and very large cabbages which we could have harvested but these were left for a later date. If you read Martyn's blog you will know that one variety of carrots that we are growing - and the one we harvested this weekend, Chantenay Royal - is producing monsters. We don't thin our carrot seedlings and don't fret too much if some are locked in a tight embrace. Twisted carrots taste just as good as straight ones even if the supermarket buyer would turn up his/her nose and prefer those tastless perfectly formed specimens. 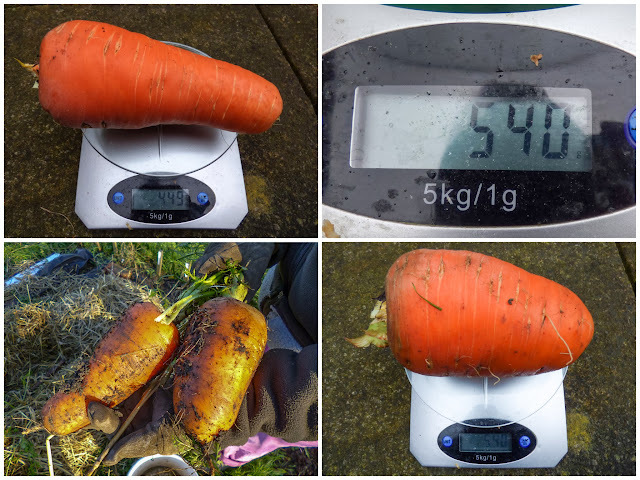 One seed company describes Chatenay Royal as producing 'small conical roots', so we weren't exactly expecting carrots like these. As they have grown, rather than cuddling up to carrots growing alongside them, they have muscled one another aside. Most of the roots are supersized but their are one or two smaller roots growing in amongst the jumbos - ones that just didn't develop their muscles in time. 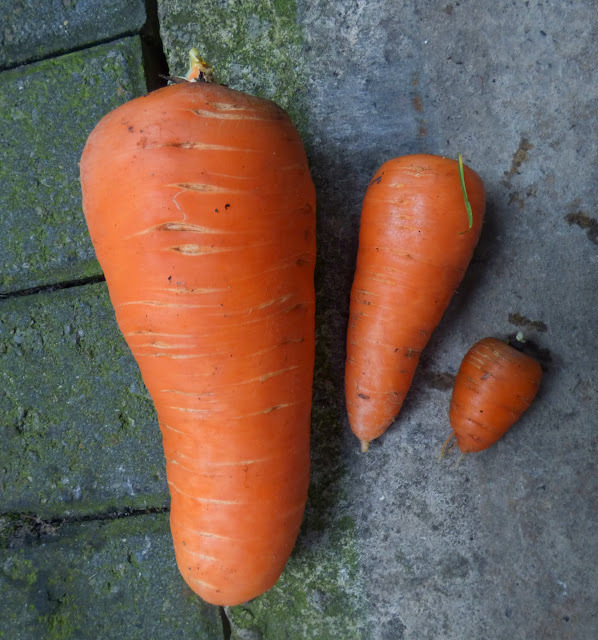 These monster carrots are still sweet and carrotty having lost none of their flavour. 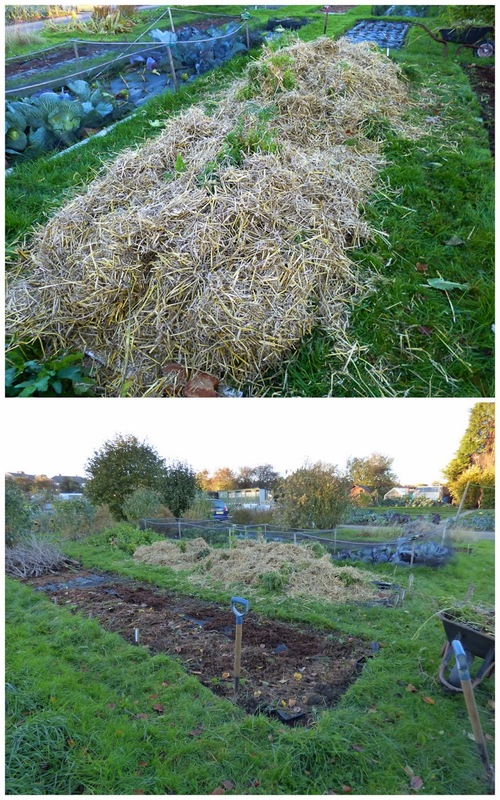 Hopefully our carrots will stay well protected under their straw blanket and keep us supplied over winter. However, when a recipe calls for one carrot there could be a problem. 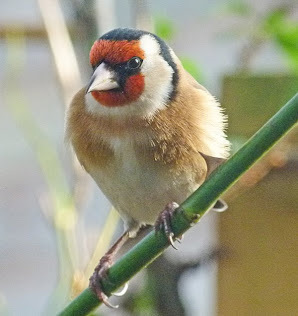 In the depths of winter the birds that visit our garden provide us with the main source of garden interest. 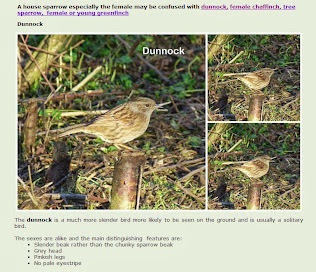 In winter we spend many an hour watching and photographing the various species of bird that visit our garden. 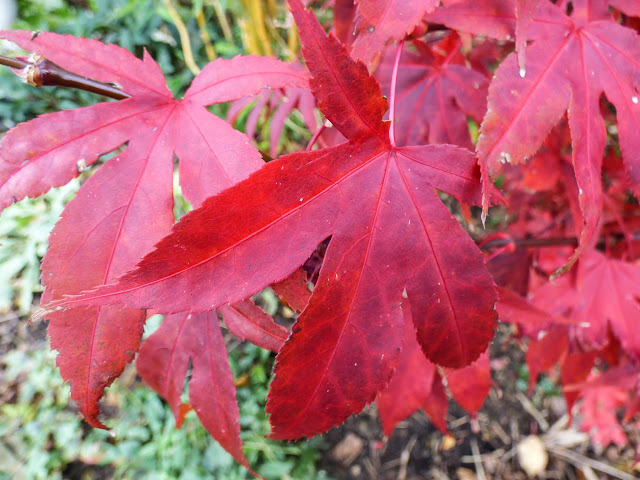 I've posted about the varieties that visit us here. Some are regulars whereas others are rare visitors that cause much excitement when they are spotted. 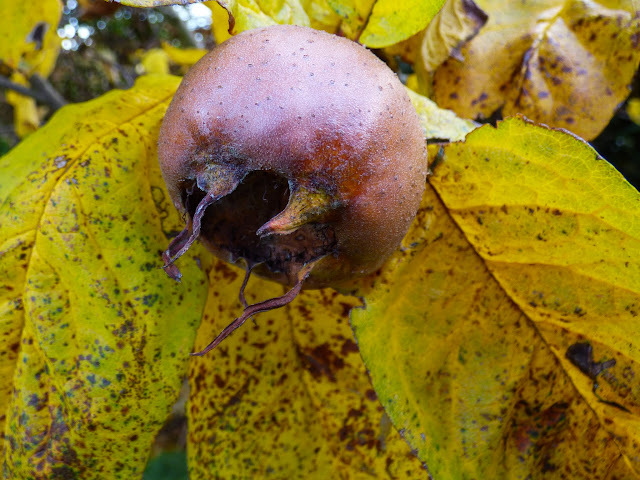 We have a variety of bird foods and ways of offering it to our bird visitors. 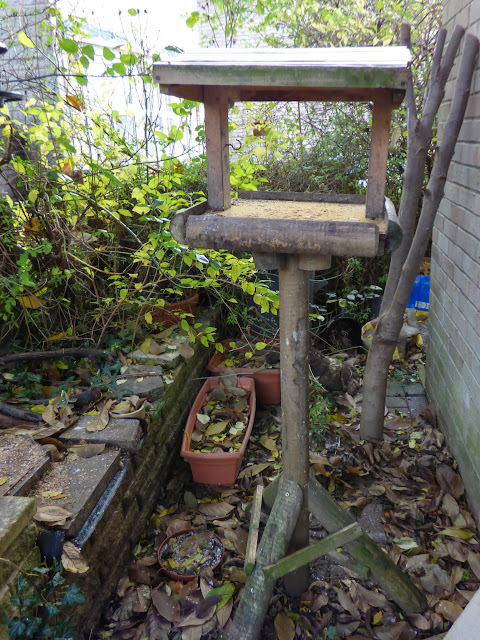 This post concentrates on our bird tables. A while ago we tried to buy a new bird table but found that the ones on offer seemed to be built more for decoration than anything. The table area was quite small and the roof of many was too low. 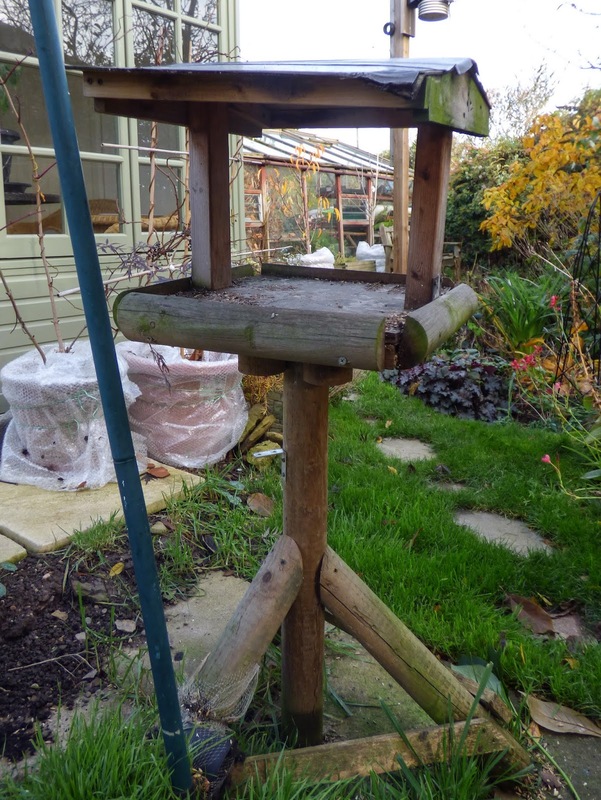 As a result Martyn decided to make a bird table. In the end he made three - one of which was given to my sister. The table above is very close to one of our house windows. The birds are used to this and if we keep very still we can get a really close view of them feeding here. We have a male blackbird with a bad leg that has been visiting this table for months. When we first noticed him he was in a very sorry state and we thought his days were numbered. He sheltered on the table during the day hardly leaving it. I really don't think he would have survived without us providing him with food and shelter. Now although he can't use one of his legs he waits each morning for his breakfast of buggy nibbles. When we stand in the window he looks straight at us unconcerned. Our second table is a bit shorter and is close to the summer house. 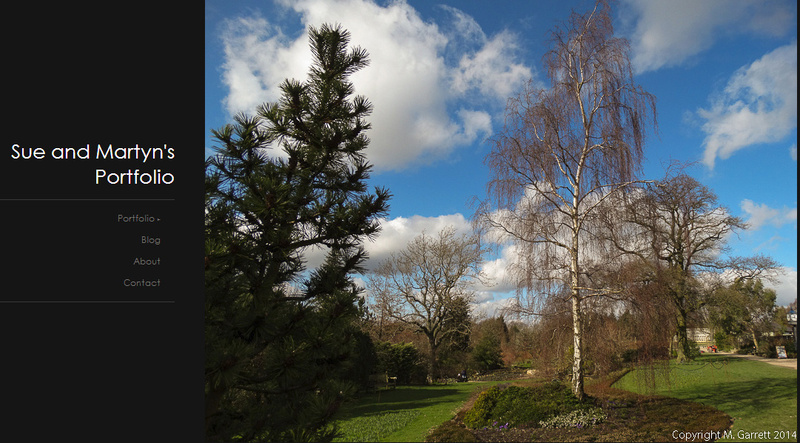 The lower height means that even though it is positioned at the top of some garden steps we can still see visitors from the house window. Our old bird table had lost it's roof and the legs were rotting but the birds still visited and so it was left in place. 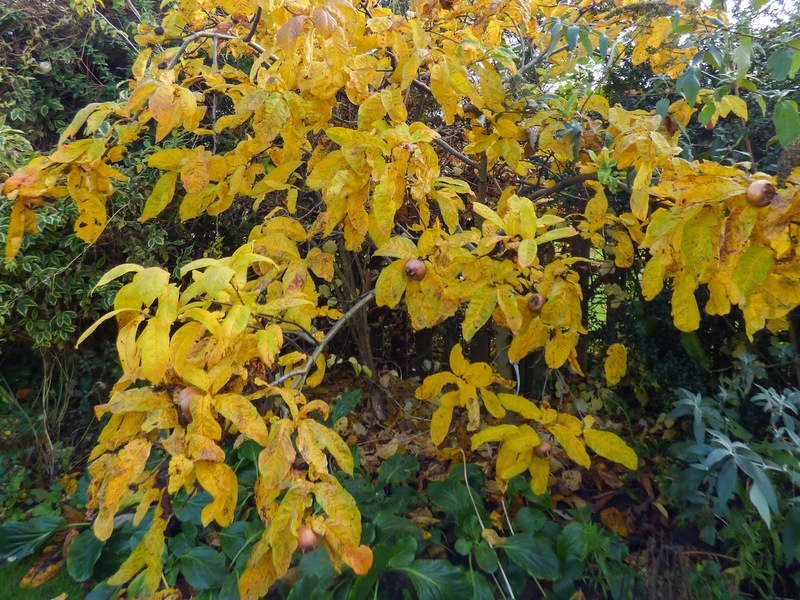 Being under a crab apple tree and snuggled in amongst a rhododendron the birds have somewhere to hide whilst waiting for a turn to feed and also can easily fly out of the way if danger threatens. Our fourth table is a ground feeding station and is situated under the sunflower heart feeder. When the feeder is being used some food spills out and lands on this table providing food for birds unable to find a space on the hanging feeder. In winter birds really need fatty food and oily seeds which are high in calories. 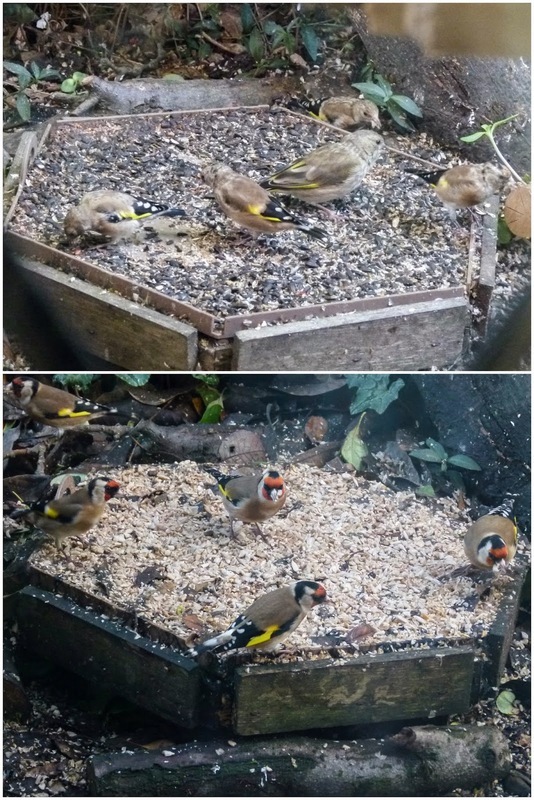 The bird tables are kept supplied with a range of foods - mainly a seed mixture but they also sometimes have buggy or fruity nibbles and dried mealworms (sorry too squeamish to provide live ones) as well as other suitable bits and pieces. On the rare occasion that we put out bread we first soak it in water so it is really soggy as dry bread can choke birds. Magpies tend to know this and so you will often see a magpie bring a chunk of dry bread and dunk it in the bird bath before eating it. I was going to go on to mention our other feeding devices but I think this post is long enough and so I'll leave those for another post. The winner of the draw is Tanya. Congratulations Tanya - can you email me your address and I'll send the Allotment Planner book off asap. There is one battle that I will not have to undertake this year. A battle after which it is always difficult to tell who had the upper hand. I usually emerge scratched and stabbed and my adversary missing a few limbs. 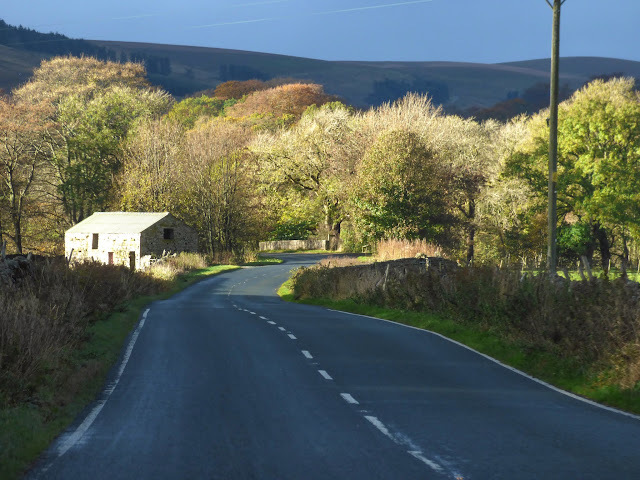 If you have been following Martyn's blog you will have an idea what I am talking about. 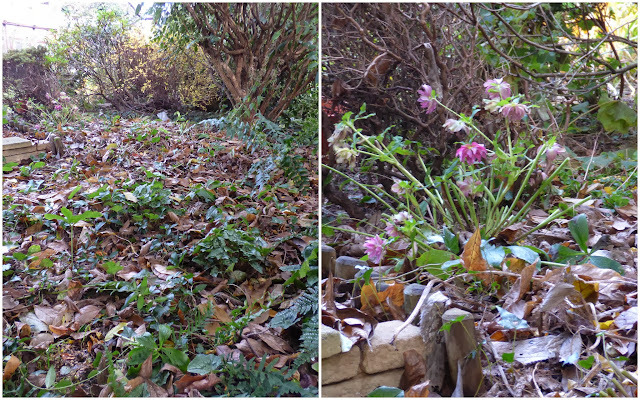 We are renovating the area in which our thuggish blackberry resides which has meant that the thug had been reduced to a shadow of its former self - indeed one or two roots. It is still work in progress but we are getting there and should be able to use the beds next season. The two beds in the the photo was where the annual flowers grew this year and has been split into two smaller beds. Once the pile of wood at the back has been burned the two beds may become three. 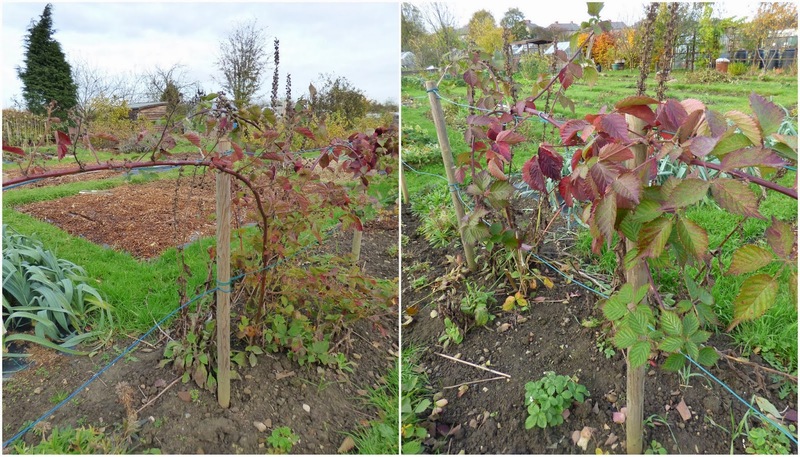 We are hoping that the stumps of blackberry root remaining in the ground will regrow but it will mean no fruit at least for next year. Although we do have blackberries elsewhere on the plot including our more restrained fairly new thornless variety - Loch Ness which unlike its thorny cousin offers painless pruning. I won't be getting away totally scratch free this year though as I still have to tackle the tayberry. 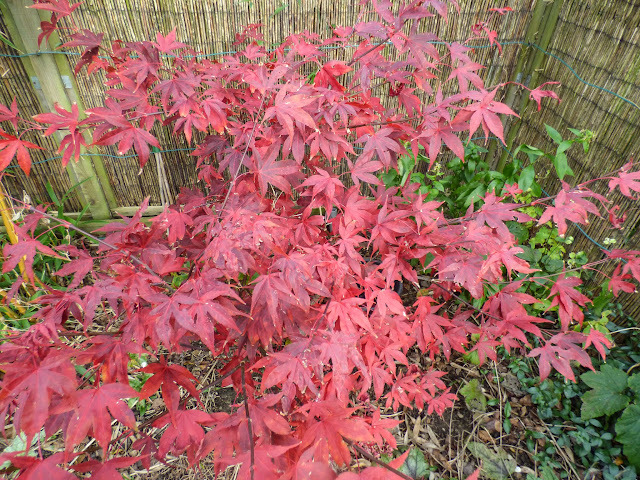 I like to wait until the canes have shed their leaves so I can more easily see where I am going so maybe it won't be a totally scratch free winter - ah well! 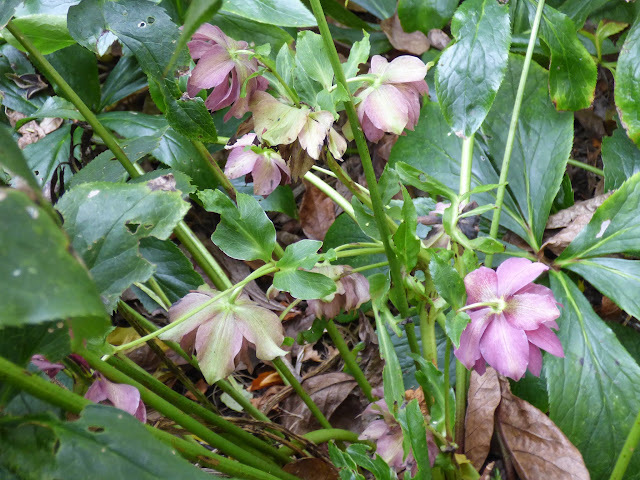 For some reason this particular hellebore always seems to flower before all the others. This year I hadn't even trimmed the old leaves when I noticed a flower so it prompted me into action and last year's leaves have now been removed. 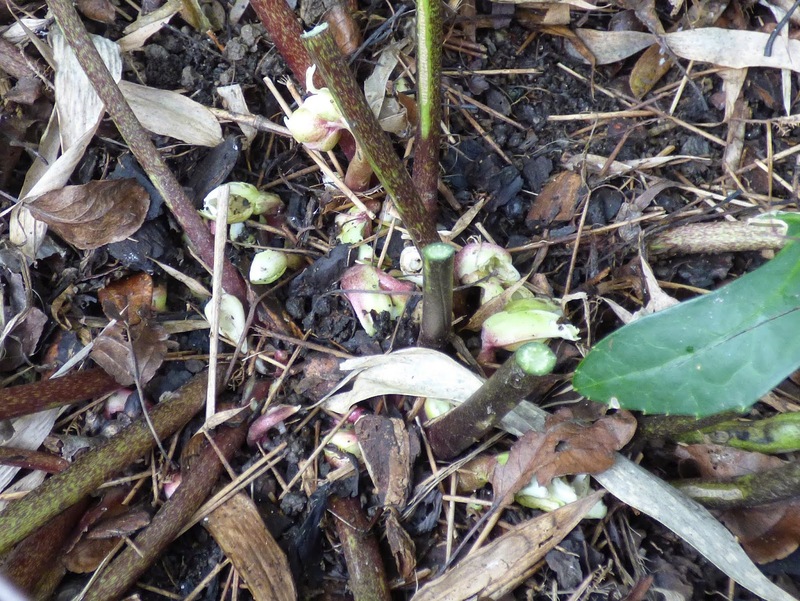 After scrabbling around amongst fallen leaves I found that my two hellebore niger which I expect to flower first are just starting to produce buds - although it looks as though something is nibbling them. (Thank you for the prompt to check for buds Shirl). The other hellebores aren't showing signs of flowering yet - just this one. It's right up at the back of the area in the photo on the left. I think this particular plant was the first to flower last year too. 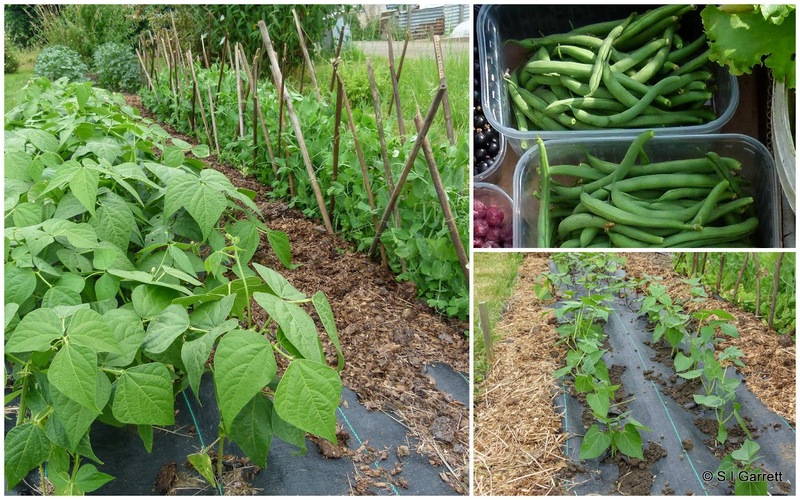 We grew four varieties of French beans, climbing French bean - Cobra, a purple variety - Royalty, a yellow variety - Sungold and a green variety - Tendergreen. 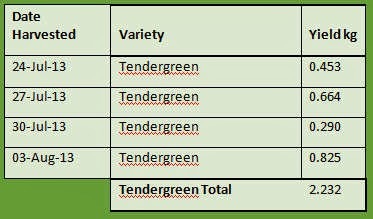 The planting schedule and harvesting summary was as follows. 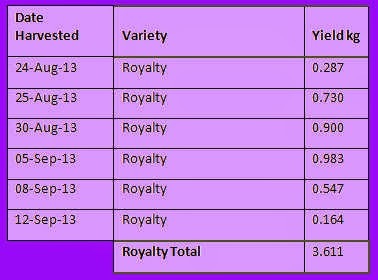 To give a fair comparison, as we planted differing numbers of plants, I have averaged out the yields to reflect the yield produced for a single plant. I also have to state here that we didn't pick every single bean produced and probably stopped picking before the plants had exhausted their supply. We stopped when there was enough beans in the freezer and we had other things in more immediate need of harvesting. We tend to hold fire on planting French beans until we are fairly sure they won't be affected by a late frost. Maybe this is a bit late compared to some of you. 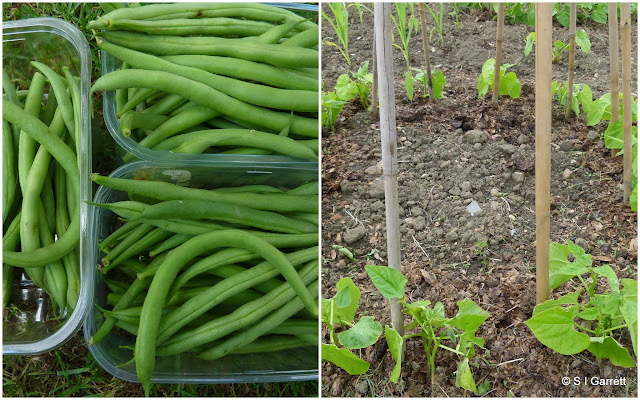 Some years we will plant a later batch but this year we planted the climbing French bean Cobra instead. Cobra was sown about week later than Tendergreen with both varieties germinating after a similar length of time - 10 and 11 days respectively. Being a climbing bean, Cobra plants were given a support made up of bamboo canes. 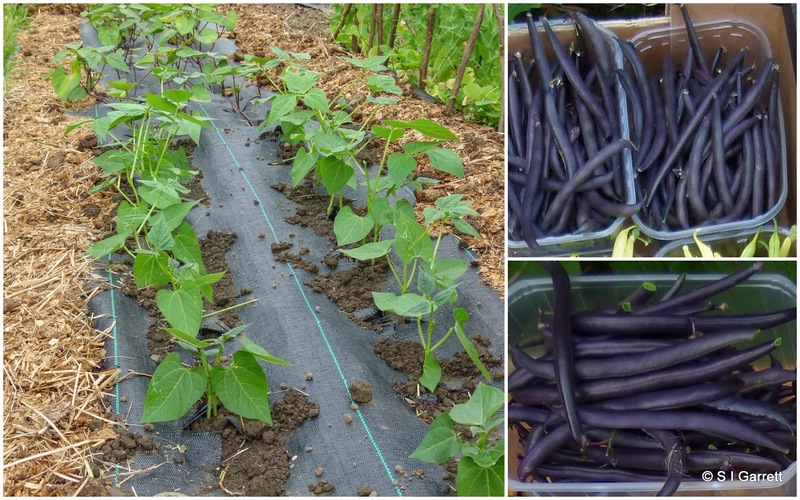 Cobra produced the highest yield per plant and took less space than the dwarf French beans so as Mark from Mark's Veg Plot would tell you has a good VSR (Value to Space Rating). Mark's enthusiasm for Cobra was the reason that we decided to try this variety. Royalty and Sungold were both sown on the same day and gerniated on exactly the same day too. They were a little quicker to germinate - 8 days - which was likely to be a result of the later sowing - about a month later than the other two varieties. Sungold was planted a week later than Royalty but we had our first pick from both varieties on the same day so the delay in planting had little effect. As a direct comparison each picking of Royalty tended to out produce that of Sungold although we had an extra picking of the yellow variety. 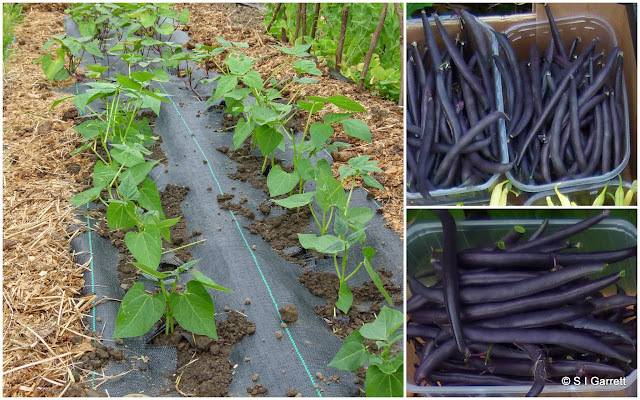 We really grow the different colours to add variety even though the purple beans lose their colour when cooked. 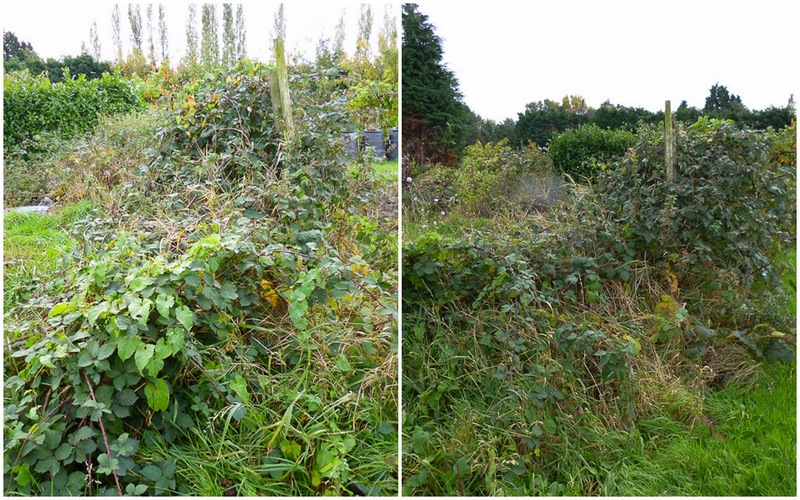 As you will have noticed the dwarf beans were grown through weed control fabric. This didn't adversely affect how they performed - which was a relief. There was no extra slug damage - if anything there was less. It's hard to say whether the weed control had a benefit with relation to plant growth as this year's weather conditions were quite different to last year's, however the beans were certainly cleaner as they didn't sit on the soil. 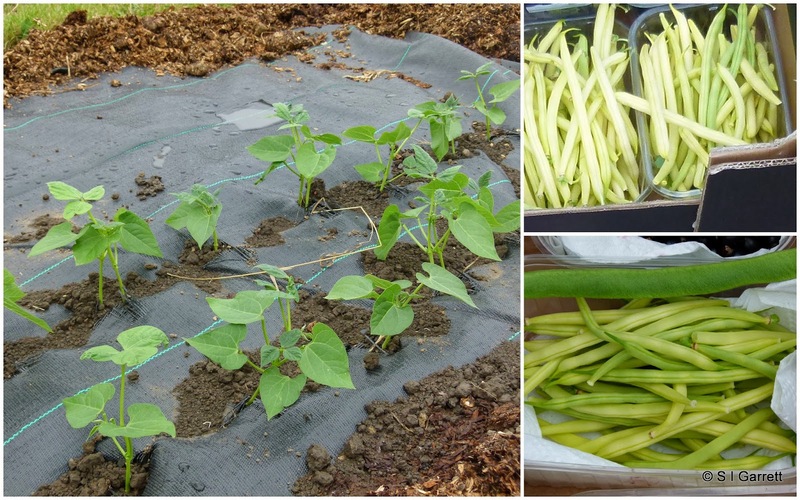 Whether the fabric reduced slug damage, warmed the soil and reduced evaporation so the roots benefited is difficult to determine without growing some beans without the fabric and I'm not going to those lengths - sorry! One thing I can report though is that the French beans were not weeded once after they were planted out. 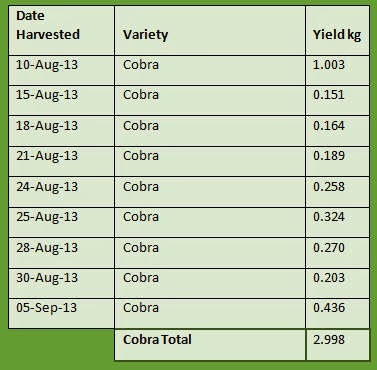 To summarise the yield Cobra had the highest yield per plant - almost twice the yield of Royalty and Tendergreen that tied in second place. 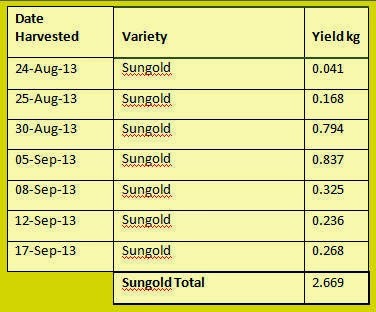 Sungold trailed behind but was worth inclusion for colour variety. Each plant has a different flower colour too - you seem to be able to identify what colour of bean will be produced by looking at the flower. 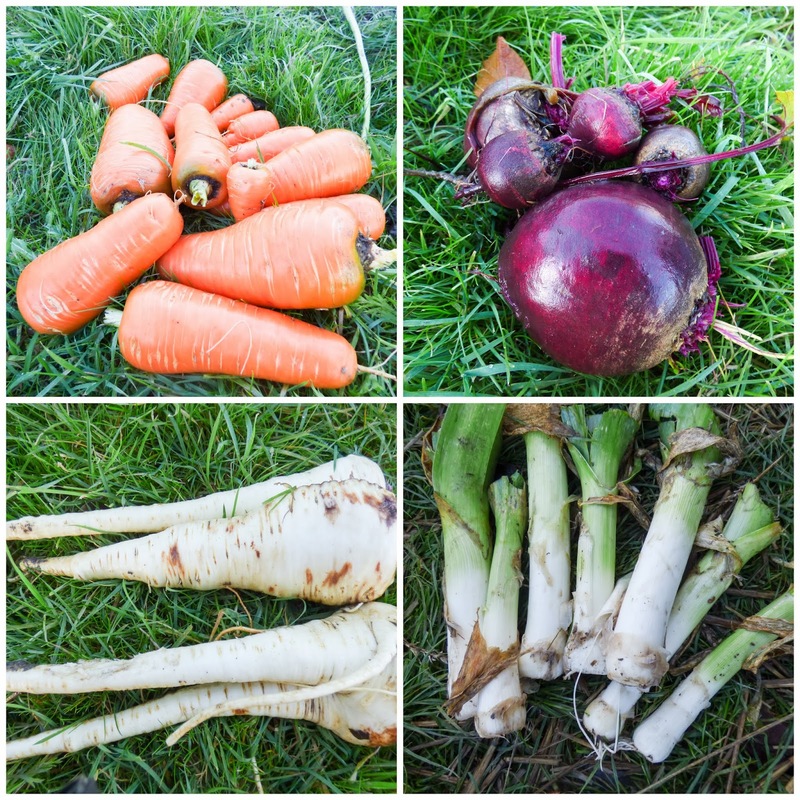 Our overall harvest amounted to just over 11.5kg and provided us with a sufficient quantity to eat fresh and also supply both ours and my sister's freezer. As for flavour they all were more or less the same. 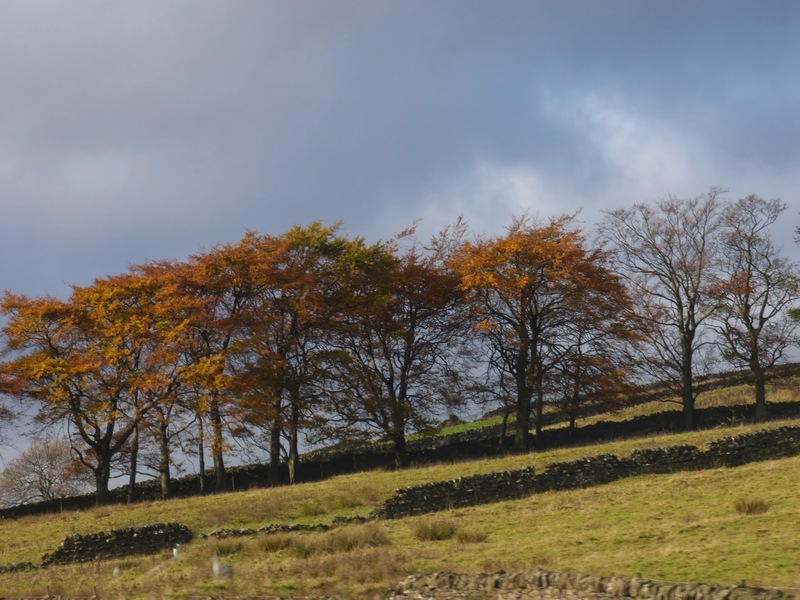 We still have to consider whether we grow the same varieties next year or try something different do you have a favourite? 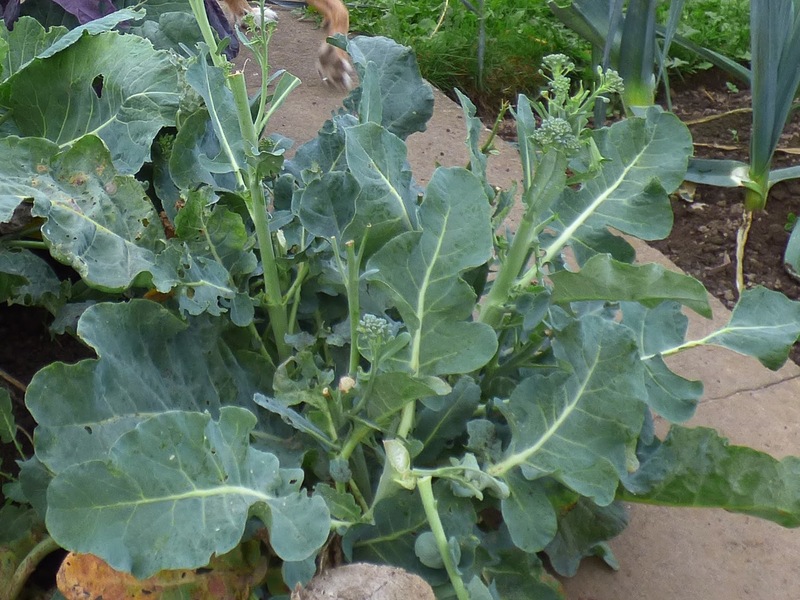 Jan one of our plot neighbours was mystified as to where his broccoli heads were disappearing to. Each time he went to pick some for dinner he found that the tasty bit had been snapped off and just the flower stalks remained. Then as we were having a chat this happened. Just in case you missed the action - here's the culprit caught in the act again. It seems Jan's dog, Max has developed a partiality for broccoli and we watched him walk along the row selecting the choicest morsels and then sneaking away! 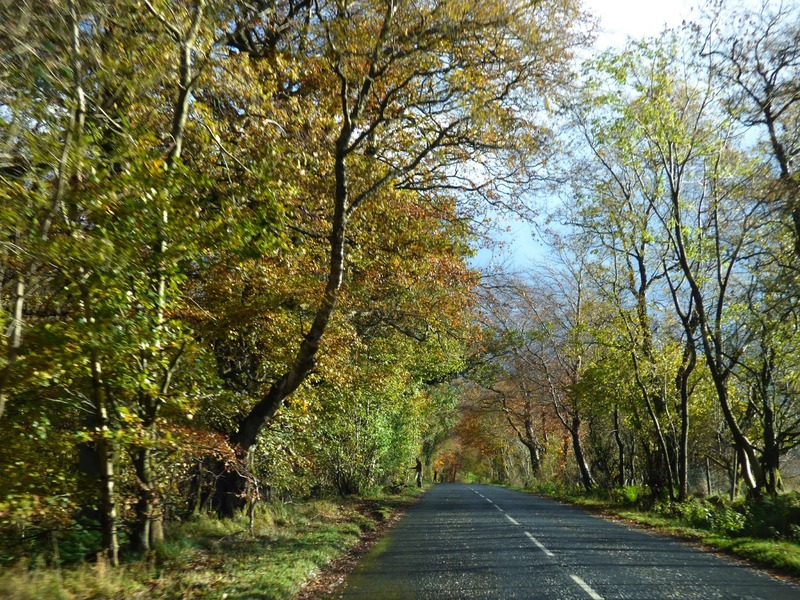 If you missed out in Jo or Mark's draw here's a chance to try again - it may be a case of third time lucky for someone.